Did you know that Karachi’s first French restaurant initially opened up in the Alliance Française de Karachi? Florence de Villiers, who had came to Pakistan from France and settled in Karachi many years before, wanted to be able to treat her Karachi-based kids to good French crêpes, the kind that she had grown up eating and which she couldn’t find anywhere in the city. She approached the then-director of the Alliance, Bernard Frontrero, who encouraged her to open a little café inside the premises of the French cultural center. What emerged from that conversation was Café Flo at the Alliance Française de Karachi. Named after its founder Florence (pictured above), it began with a crêperie and slowly grew into a full-fledged French restaurant offering authentic delicacies like escargot, beef bourguignon and much more. Its charming ambiance felt like a piece of Paris in Karachi, with snippets of conversation in French, a terrific menu, green vines, and quirky art posters lining the watermelon walls. While Café Flo has since moved out to its own premises and continues to regale Karachiites with French cuisine, we at the Alliance Française are proud to have given it its first home and launching pad. Today, the space is home to Côte Rôtie, another excellent space for French cuisine with an ambiance to match. Et vous? 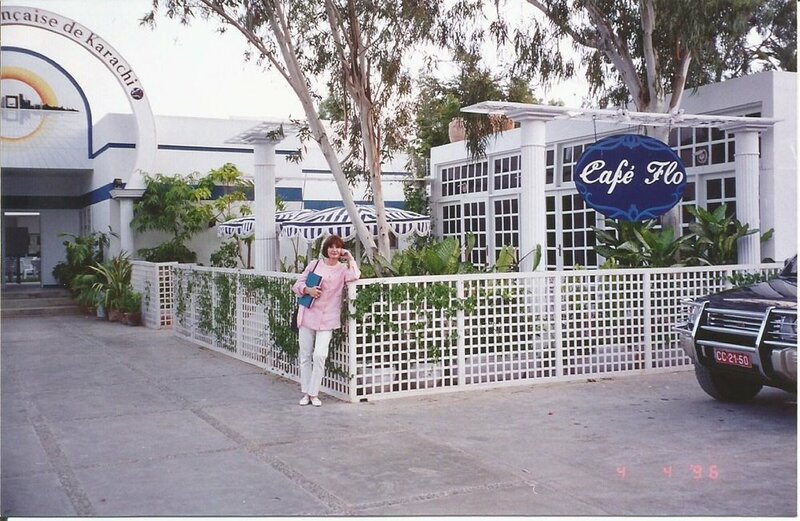 Do you remember coming to the original Café Flo? What’s your favorite French food? If you’ve never had the chance to try it, come discover French language, cuisine and culture at the Alliance Française in Karachi for yourself to learn more.